Once famous for its rows of independent electronic shops selling hi-fi, computer gear and other consumer electronics, London’s Tottenham Court Road looked a bleak place last Saturday afternoon, with shoppers passing deserted shop after deserted shop. The electronics trade in the street has been in decline for years – the long serving Micro Anvika shut up shop in February this year, and we reported on the rapidly vacating businesses back in August 2012. At the top can be seen the former premises of Jessops at 154 Tottenham Court Road, while above is the former premises of Micro Anvika, soon to reopen as a trendy Asian restaurant. Ten years ago, Tottenham Court Road was the place to go for laptops, cameras and other electronic devices, but the growth of cut price internet stores and – it has to be said – a less than stellar reputation for some of the traders, has seen the street fall into terminal decline. 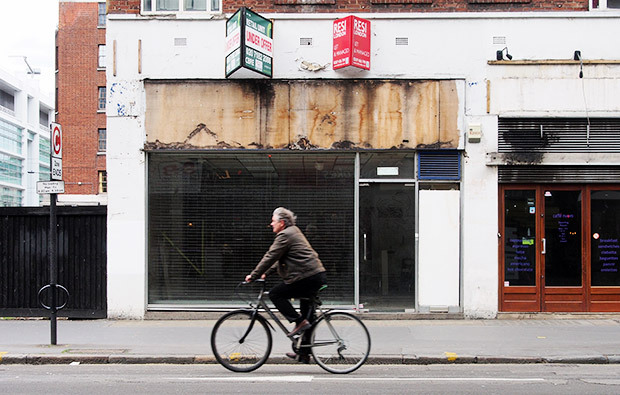 Although there’s still a few businesses grimly hanging on, we’ll be surprised if many of them last out the year – click on the picture above to see a large scale photo showing just how bad it’s become. I was gonna buy a Zalman mechanical keyboard from the Compaq store next to the Samsung store and he wanted to charge me 70 pounds but I checked Amazon and found out it sold for 35 pounds, same goes for a Razer keyboard which was for 130 pounds while it’s for 65 pounds online. Sad…Was the place to be in the 80’s. A lot of the traders on Tottenham Court Road, did themselves no favours by trying to charge inflected prices, no wonder majority of them are gone.